Tuesday September 29th was a big day. Downtown Disney was renamed Disney Springs. 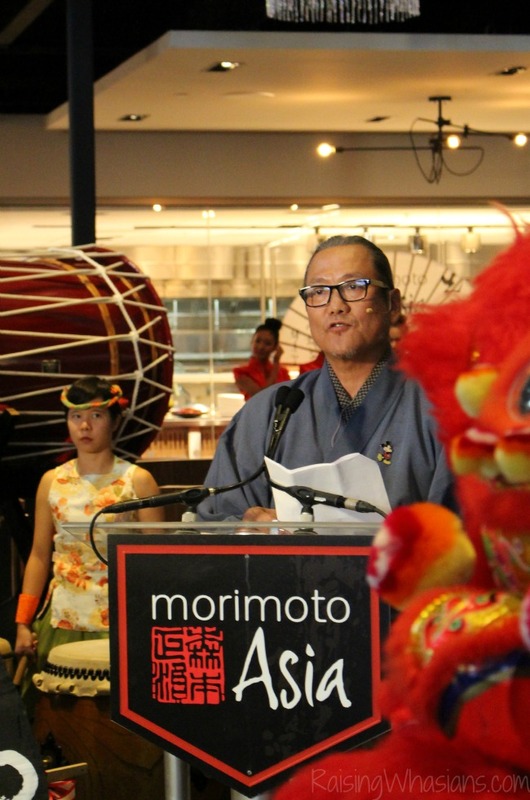 Morimoto Asia celebrated it’s grand opening. And I got to meet my childhood cooking hero. To say that the newest Disney Springs restaurant opening was “grand” would be an understatement. 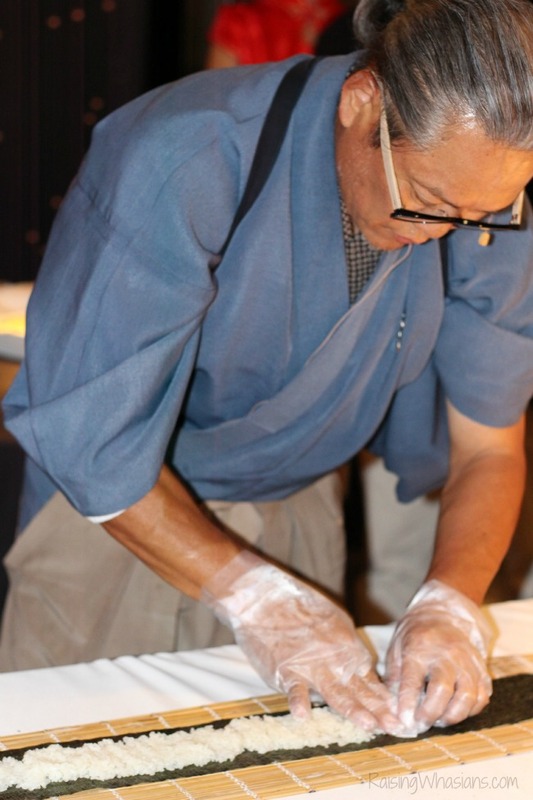 From delicate eats to the longest sushi hand roll I’ve ever seen, check out what made our evening with Legendary Iron Chef Morimoto so memorable. Remember Mannequins? That Pleasure Island Dance Club of old may be just a memory for this section of Disney Springs, but if you look closely, you can still picture the spinning dance floor. 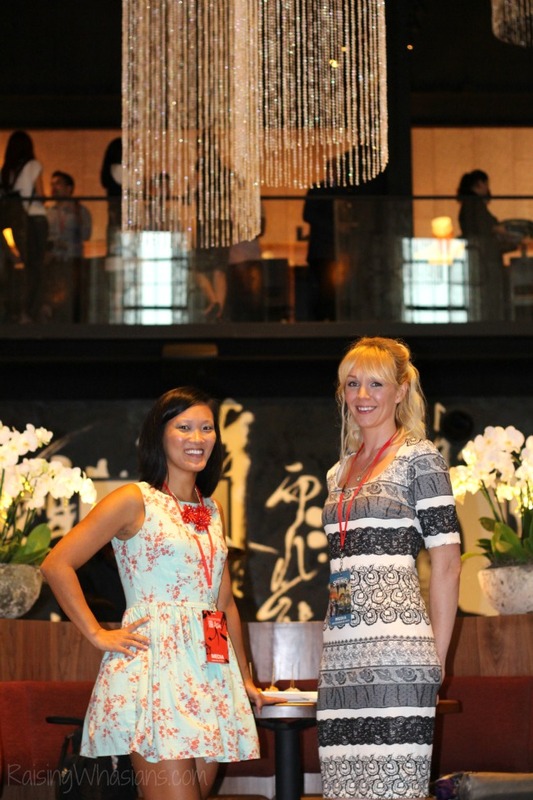 But the transformation of the old nightclub definitely has the feel of an upscale Asian Fusion restaurant. The hanging light fixtures are definitely the first thing you notice. The 2 levels provide an open atmosphere. 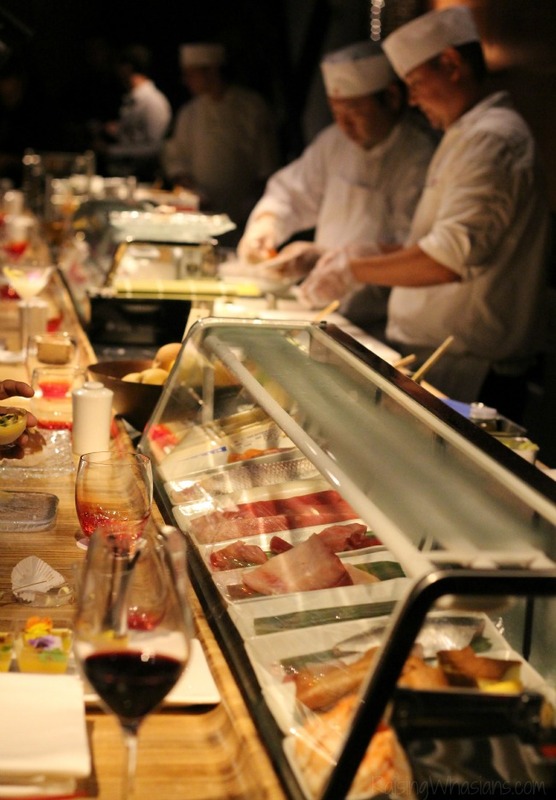 Featuring bars on both floors, a sushi bar and open air private dining rooms, there’s quite a bit of experience to take in. You never quite know the experience to expect when attending a grand opening event such as this one. And I would say a sake barrel and mallet ceremony definitely set the tone. Toasting to the guests, Morimoto ended his speech with grand style. 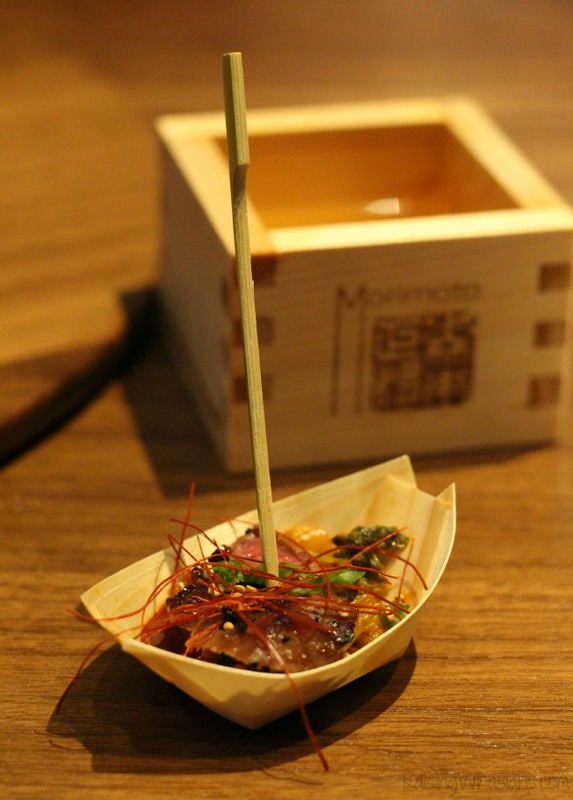 And if I wasn’t having flashbacks to my childhood show Iron Chef already, then Morimoto got down to business. 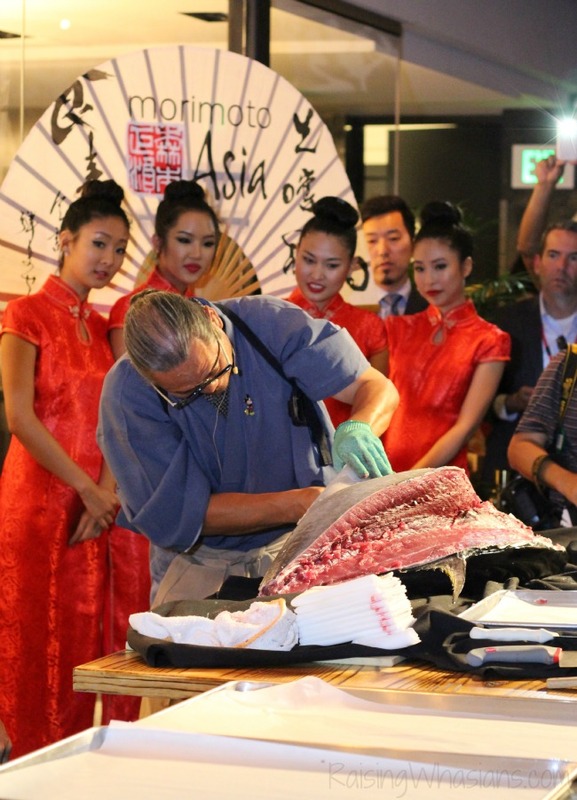 Tying back his ceremonial outfit, his hand and knife skills were put to the ultimate test as he broke down his own gigantic tuna. I could hear the sounds of kitchen stadium as sou chefs bustled around to help the legendary chef clean and prepare the fish for the evening. So if filet-ing your own fish wasn’t enough, Masaharu Morimoto then assembled one of the longest sushi roll lines I have ever seen. Seaweed, rice, tuna and a bunch of attendees all lined up to try their hand at sushi creation. 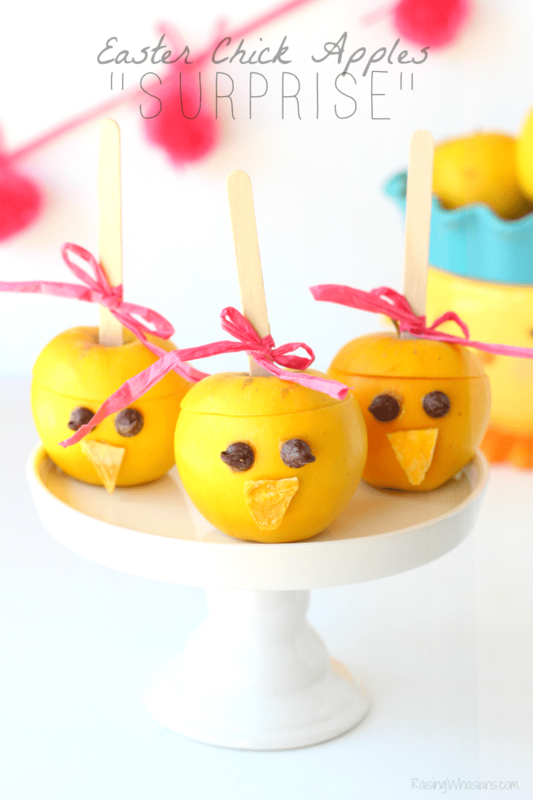 Not as easy as it looks…but definitely fun! And the bites for the evening? Delicious. 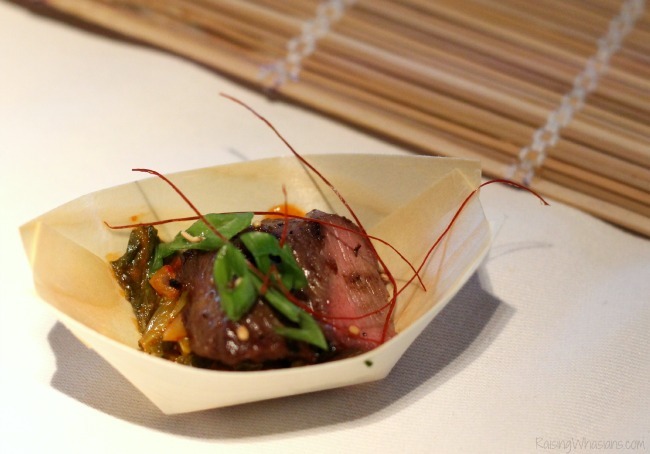 The passing of trays continued all night long, but these were my favorite standout dishes. So. Much. Goodness. Slow cooked, falling apart and topped with a sweet hoisin chili sauce. Yes, please. 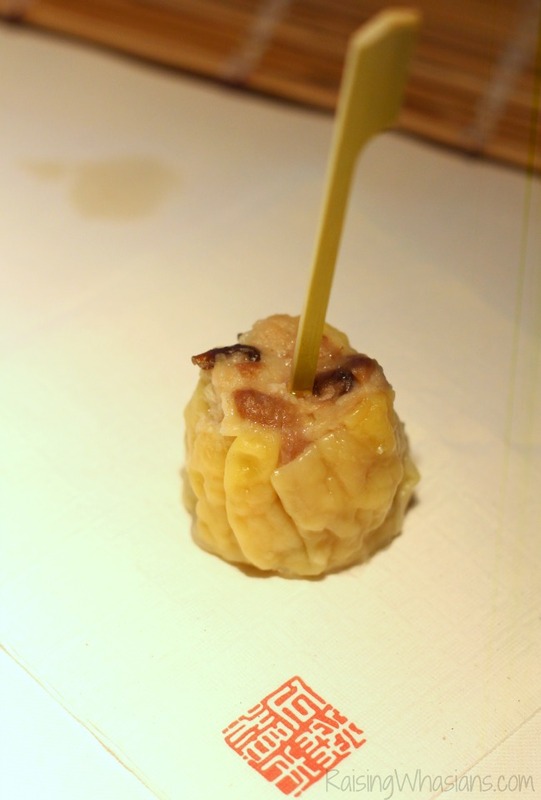 I don’t normally rave about dim sun, but this chicken shumai bite was perfectly steamed and filled with delicate chicken and mushrooms. This was my friend’s favorite dish of the night, and you could tell it’s the signature dish. Perfectly roasted and displayed from the kitchen, this carved duck is served with apricot sweet chili and hoisin miso sauces. 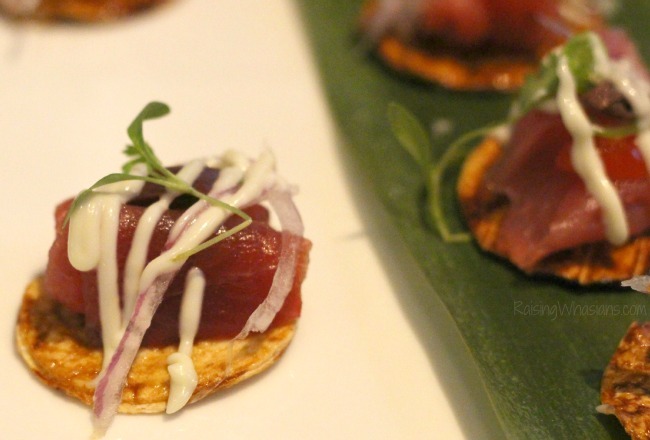 Opening night at one of Disney spring’s newest and upscale restaurants would definitely be a highlight of my blogging career. But my fandom for not only the famous Japanese show but my ultimate favorite Iron Chef Masaharu Morimoto transcended beyond one night. 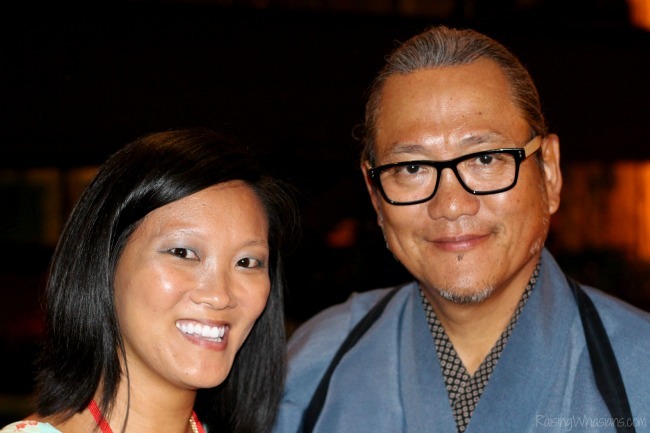 All of my cooking dreams relived, the gracious Morimoto stood for a photo with me. I could feel Chairman Kaga patting me on the back for this moment. A fabulous evening? Not even close. 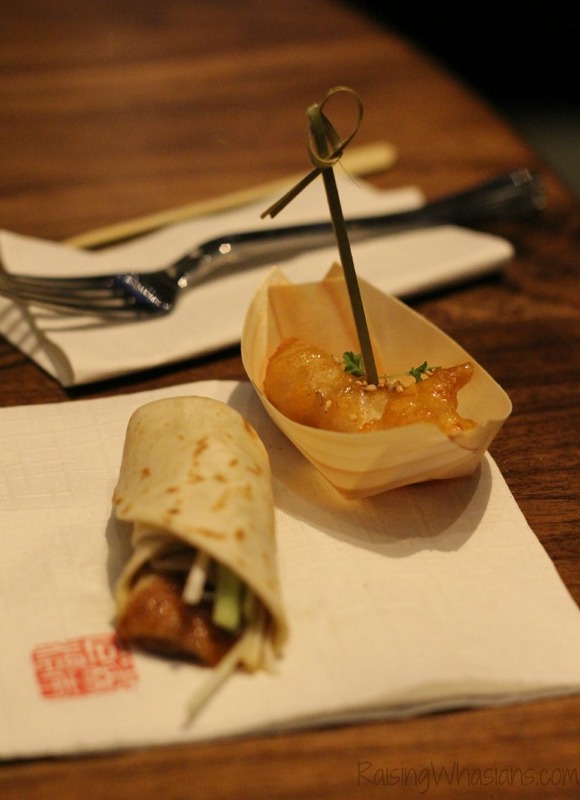 For a grand opening of the swankiest Asian cuisine at Disney Springs, it was Disney magic! 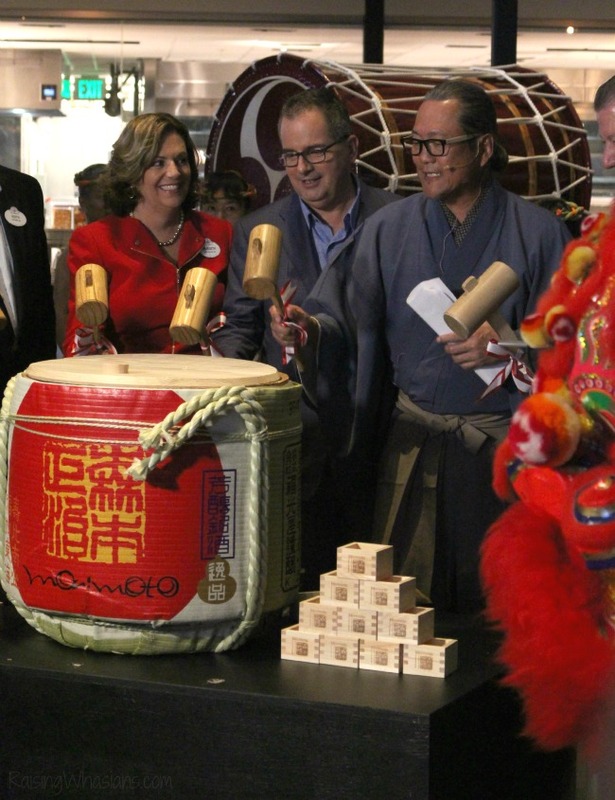 Morimoto Asia is now open to the public and is located at Downtown Disney Disney Springs across from the Raglan Road Irish Pub. I highly recommend reservations (call 407-939-MOTO). I hear that reservations are already into November! Be sure to ask for a private dining room if you can 🙂 Check out the full website for more information. Menu options (including kids meals) can be found HERE. 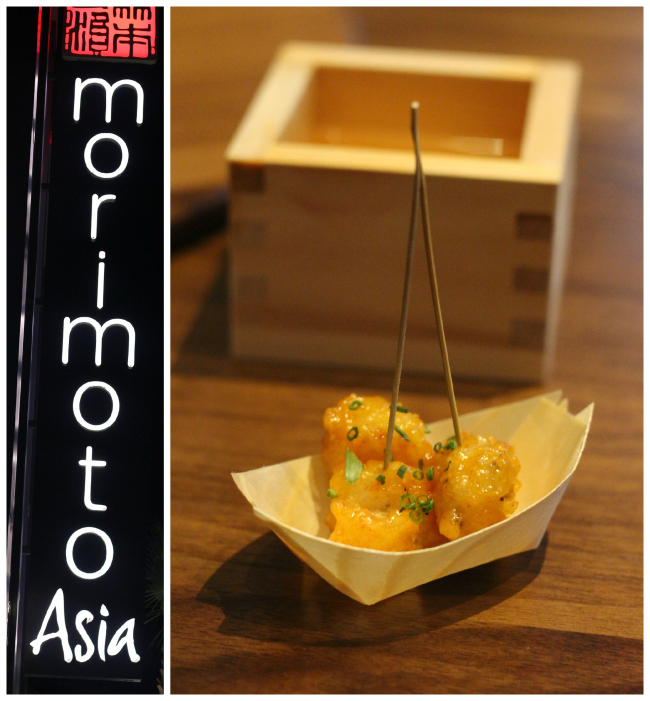 Be sure to follow Morimoto Asia via Facebook, Twitter and Instagram for the latest dish inspiration, specials and more. 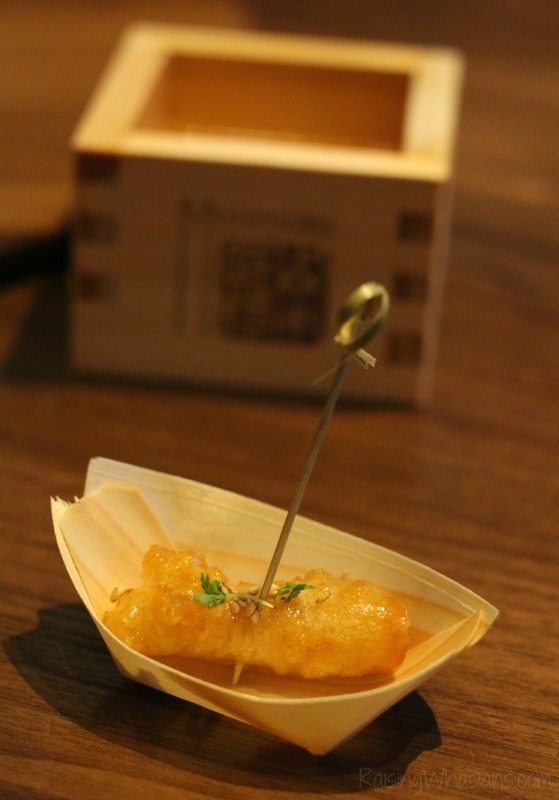 Would you and your family visit Morimoto Asia at Disney Springs? I was invited to attend a special media grand opening event. All opinions are my own. Be sure to follow Raising Whasians via Facebook, Twitter, Google, Instagram, Pinterest and YouTube for Disney updates, family travel moments and more. It’s Chef Morimoto! Looks like a wonderful time. Looks inviting! I’m not sure if we’d go or not! Would I visit here? You bet your sweet sushi! Wow, the ultimate experience and you got paid to do it!! We are going to Disney in February, I might try this one out! I can’t wait to eat here next time we visit WDW. 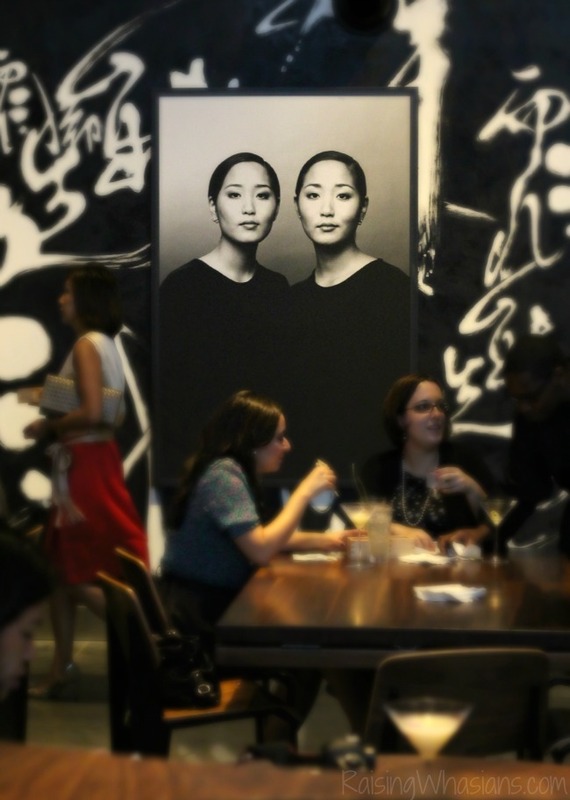 This place looks amazing, love the décor and the food looks fabulous! Awesome you got to meet Chef Morimoto, I would have been star stuck after watching him on tv all this time lol. This sounds like a great restaurant. If I every .make it Disney I will have to.check it out.